ASCE705W is a spreadsheet program written in MS-Excel for the purpose of wind loading analysis for buildings and structures per the ASCE 7-05 Code. Specifically, wind pressure coefficients and related and required parameters are selected or calculated in order to compute the net design wind pressures. 1. Worksheet for "Simplified" analysis is applicable for low-rise buildings meeting the criteria of Section 6.4.1. 2. In the worksheet for Simplified analysis, the design MWFRS wind load is calculated for each direction. The design MWFRS load is assumed to be the total wind load on either the width or the length of the building respectively. 3. Worksheet for "MWFRS (Low-Rise)" is applicable for low-rise buildings as defined in Section 6.2. 4. Worksheets for "MWFRS (Any Ht. )", "Wall C&C", and "Roof C&C" are applicable for buildings with mean roof heights of up to 500 feet. 5. In worksheets for "MWFRS (Any Ht. 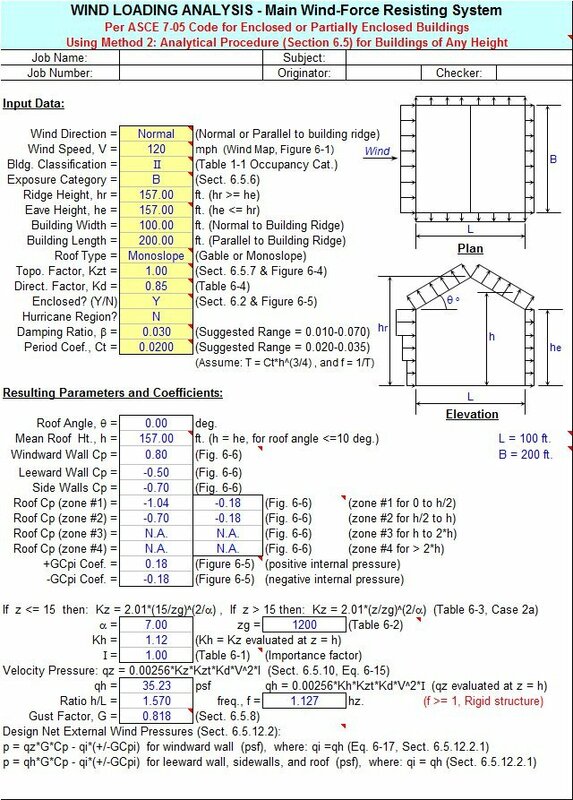 )", "Wall C&C", and "Roof C&C" the user may opt to utilize user designated steps in height, 'z', in determining the wind pressure distribution. 6. Worksheets for "MWFRS (Any Ht. )", "Stacks & Tanks", and "Open Structures" can handle “rigid” as well as “flexible” buildings and structures. For “rigid” buildings or structures, this program uses the smaller value of either 0.85 or the calculated value from Section 6.5.8.1 of the Code for the gust effect factor, 'G'. For “flexible” buildings or structures, this program calculates the gust effect factor, ‘Gf’, per Section 6.5.8.2 of the Code based on the assumed formula for the fundamental period of vibration from Section 12.8.2.1 of the Code, where the exponent 'x' in the formula T = Ct*h^x is assumed to be 0.75. 7. 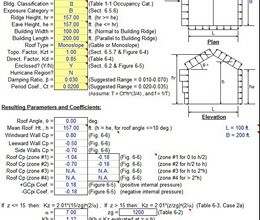 Worksheets for "Wall C&C" and "Roof C&C" are applicable for flat roof buildings, gable roof buildings with roof angles <= 45 degrees, and monoslope roof buildings with roof angles <= 3 degrees. 8. Worksheet for "Stacks & Tanks" is applicable for cantilevered structures up to 600 feet tall. 9. Worksheet for "Open Structures" is applicable for open structures without roofs up to 500 feet tall. This can be utilized for open process-type structures as well as pipe/utility racks and bridges. * ASCE705W download link provides freeware version of the software. ASCE702W is a spreadsheet program written in MS-Excel for the purpose of wind loading analysis for buildings and structures per the ASCE 7-02 Code. ASCE702S is a spreadsheet program written in MS-Excel for the purpose of flat roof snow loading analysis for buildings and structures per the ASCE 7-02 Code. ASCE705S is a spreadsheet program written in MS-Excel for the purpose of flat roof snow loading analysis for buildings and structures per the ASCE 7-05 Code. ASCE705I is a spreadsheet program written in MS-Excel for the purpose of determining ice loading due to freezing rain on structural steel members per the ASCE 7-05 Code. ASCE705W has been rated 5.0 out of 5 points. A total of 3 votes cast and 0 users reviewed the software.